Look outside – study how other schools have changed, which you can accomplish through correspondence, inviting them to your school, or going to theirs. Customize for your environment – what works for others won’t for you, and vice versa. That’s okay. Take what you need and change it to fit your specific circumstances. Evolve – the only constant is change, and you will need to adapt your plan to the vicissitudes of the modern era. While I was away for the conference, there was a heated “traffic jam” over teachers trying to reserve labs and laptops for their classes. When I came back, I noticed again just how many of our students were bringing their laptops to school and using them in class, despite us not having a formal BYOD policy. There were other things that nagged at me. Our student numbers were climbing back up to pre-coup levels, Malitel was digging trenches for fiber optic cables all around town, and our school community was organically working and learning in ways that pushed the limits of our resources. I realized that it was time for us to innovate – it was time for us to go 1:1. 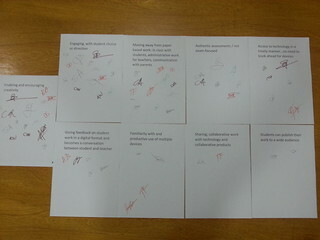 Our staff’s response to Learning2 principles. Three initials for every faculty member – we have a small staff. So our first day back, having looked outside at Learning2, I made my pitch to the faculty. I presented a list of Learning2 principles that my extended session attendees had brainstormed and listened inside by inviting our teachers to add to and modify it. We then voted for what we felt was most important by initialling three principles. I plan to take these and articulate them into a list of specific learning activities and then use that list to draw up the devices and software that can help us achieve them. The next day, I sat down with the PTO and gave them the same pitch, inviting them to join me in developing and articulating these values and goals as well. I hope that a few of them will step up or find someone from the community who will. Since I play so many roles at the school I need to outsource some of the work. Finally, this week I’ll ask our advisory teachers to see if any students are interested in being involved in the process. We recently moved to a new student leadership model based on AES-New Delhi’s approach, and it is perfect for getting interested students to help provoke meaningful change. Clearly these steps won’t be sequential. I’ll continue to look at models of other schools, and the community engagement process with extend for weeks, if not months (not that it ever really stops). Stay tuned for how things develop.